This is the shocking moment a vicious brawl erupts between huntsmen and protesters – leaving one animal rights activist with a fractured SKULL. The horrific footage shows a protester being confronted by a man dressed in hunting gear before two others attack him on the ground, leaving him with blood pouring from his face. 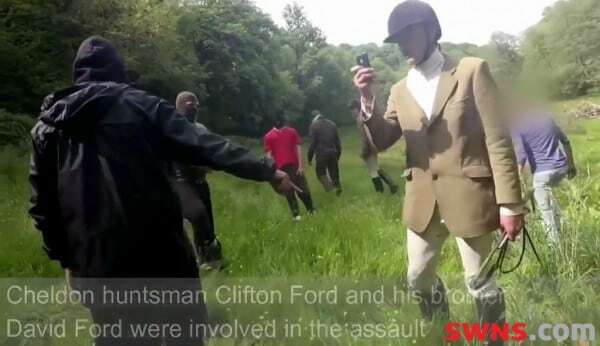 Saboteurs claim they were staging a peaceful protest at a meet of the Cheldon Buckhounds, who were out with their dogs, before they were attacked. 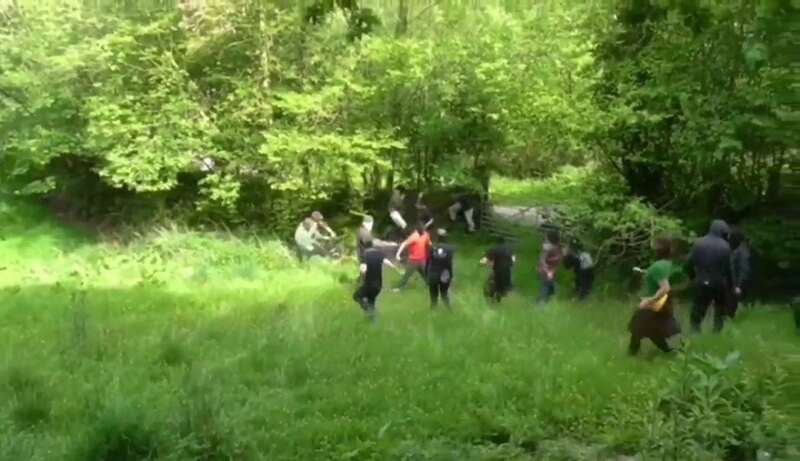 The shocking footage shows the encounter turn violent after an anti-hunt campaigner strayed from the group in secluded woodland in South Molton, Devon. Many others, dressed in balaclavas, masks and camouflage gear – who the protesters claim were hunt supporters – joined the melee. 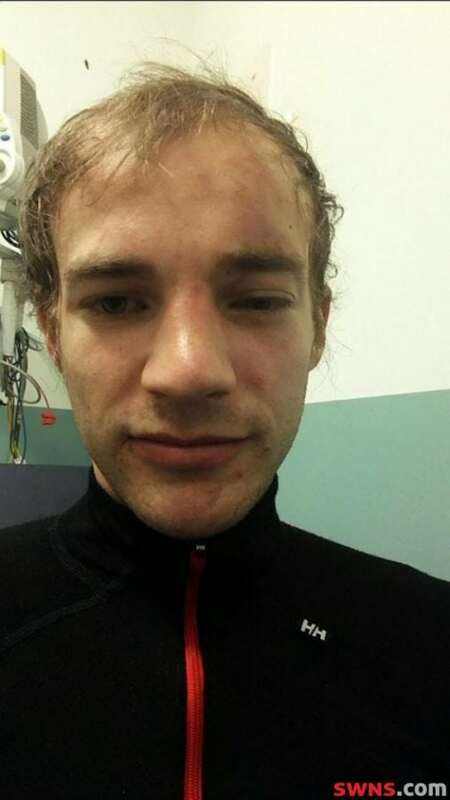 Protester Ollie Richmond suffered a fractured skull and eye socket trying to protect fellow saboteur Andy Kane, 53, who was allegedly hit with a motorcycle helmet. Plumber Ollie, 28, of Devon, said: “It has been a traumatic experience and the police have been terrible. “They basically dropped the case due to the fact that the guys had a good lawyer and they claimed self defence. “It’s not self defence if you are beating someone up on the floor. “These people absolutely should be charged. If this happened to anybody else the perpetrators would be prosecuted but the police don’t like hunt saboteurs. “I shoulder barged him out of the way and he looked furious and about to attack, so I placed myself between Andy on the floor and him. “He then took me down and someone else jumped on top of me and started punching me on the ground. “It all happened very fast but I remember being on the ground and looking up and seeing fists pounding down on my face. Ollie suffered a fractured skull and eye socket and was rushed to North Devon District Hospital in Barnstaple, Devon, by ambulance. 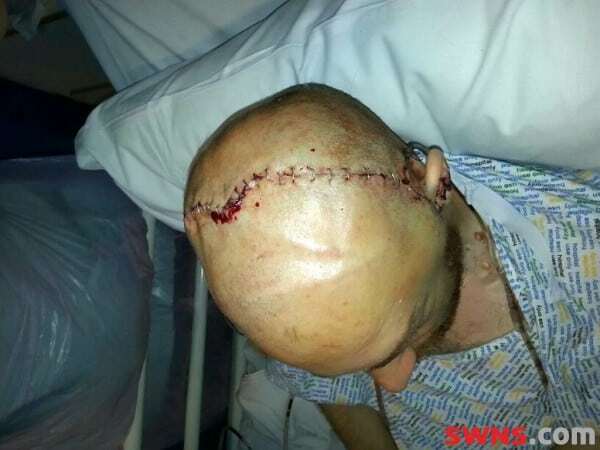 He later underwent surgery to have titanium plates and mesh could be fitted to his skull. Ollie was left with a scar on the top of his head where it was stapled back together and was off work for three months afterwards recovering. A video from from an earlier meet appears to show a man punching a female activist in the face. The saboteurs claim the attackers were connected to the Cheldon Buckhounds. But the footage shines a light on the frightening battles being regularly fought out between pro-hunt and anti-hunt supporters in Britain. Devon and Cornwall Police launched an investigation after receiving eight crime reports after the two confrontations, on May 14 and May 30 2016. None of those involved were prosecuted, however, three hunt supporters received a police caution in relation to their involvement. It is not known whether any members of the opponents’ group was hurt. The Cheldon Buckhounds could not be reached for comment today. Devon and Cornwall Police said: “Video footage was available to investigators in relation to both events from both parties. “All the allegations were investigated, witnesses were spoken to and suspects were interviewed in connection with their involvement in the offences. “There were no prosecutions as a result of these allegations. However, three individuals received police cautions in relation to their involvement. The footage, provided by the Devon County Hunt Saboteurs, was not available in its original, unedited format. life threatening violence goes uninvestigated…..another step closer to corporate fascism. Ollie might like to investigate crowd funding a prosecution of his own, especially if there is video evidence.